"Ah," you say, in black and white for some reason. "It's time to watch Games Done Quick. But only for, like, five minutes." "Oh, fiddlesticks!" you exclaim as you pour popcorn all over yourself. "It's been five days, and I haven't done anything else! If only there were a better way!" Hi. I'm Eevee, and I'm here to tell you that there is a better way. Instead of watching people play video games all week like some kind of huge nerd, you could also make a video game at the same time, like some kind of gigantic nerd. A giganerd. No judging, no rules, no pressure. Start a new thing from scratch, work on an existing thing, mod someone else's thing, take a thing off the backburner, or just goof off with an engine you've never used before. Work alone, work with a friend, work with a lot of friends, work with an entire game studio. A: No. But if you're at a loss for ideas, I heartily encourage something ironically appropriate, like "difficult to speedrun" or "takes longer to beat than it took to make" or "save the animals". Or try this theme generator! Q: Prepriculous. I know nothing of the craft of video game making. A: You fool. You utter buffoon. Anyone can video game make. If you've never made a game, this is an excellent time to start! There's only a week and everyone will be spending most of their time watching Sonic go faster than usual or whatever, so most of the entries will be half-finished prototypes. 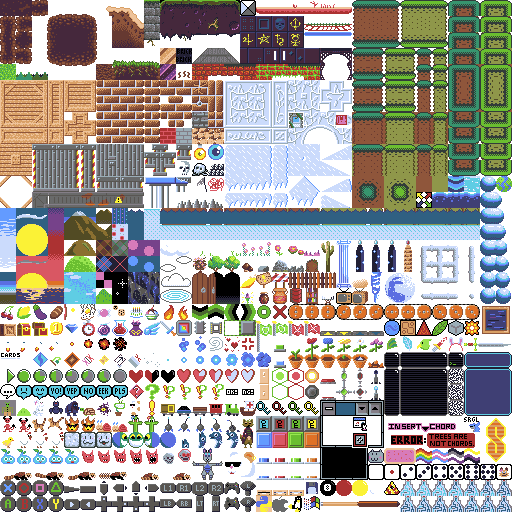 And if you do want some art, might I suggest using my crowdsourced potluck tileset, which I promised to make a game with and then never got around to? You could succeed where I failed! Your job is to drive your client places. You get a call late at night. A raccoon dog leaves his pack to see the world. He meets a slime that wants to help in hopes of finding a true friend. A two-room prototype, made for the 2018 Games Made Quick gamejam. Sleep Deprivation Avoidance Game Book, or just another unfinished gamejam game.